Malting is a time-consuming process: the soaking and hydration of the grain seeds takes a lot of time and achieves mostly uneven results. By ultrasonication, the germination speed, rate and yield of barley can be significantly improved. Malt / malted grain is widely used to make beer, whisky, malted shakes, malt vinegar, as well as food additive. During the malting process the dried grain (e.g. barley) is soaked in water to start germination. During germination existing enzymes are released, new enzymes are produced, and the endosperm cell walls are broken to release their cell contents as well as to break down some of the stored protein into amino acids. When a certain degree of germination has been achieved, the germination process is halted by a drying process. By malting grains, the enzymes – namely α-amylase and β-amylase – required for modifying the grain’s starches into sugars are developed. The various types of sugar include the monosaccharide glucose, the disaccharide maltose, the trisaccharide maltotriose, and higher sugars called maltodextrines. The steeping and germination of the grain is quite time-consuming, considering that the steeping takes 1-2 days and the germination takes additional 4-6 days. This makes the malt production time-consuming and expensive. 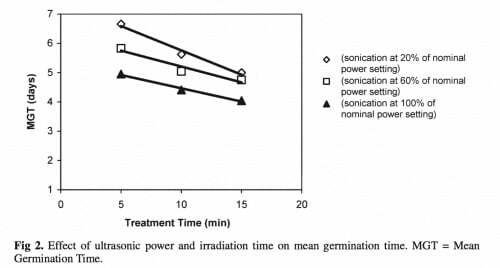 Sonication improves the germination capacity and speed of barley grains. These ultrasonically initiated effects are caused by an improved enzymatic activity and micro fissures induced by ultrasonic cavitation on the seed. The barley grain can absorb more water in a shorter period of time, leading to a significantly improved hydration of the seeds. A fast hydration and even germination are important for a good malting quality since ungerminated seeds are prone to bacterial and fungal damage. Malting is a complex process that involves many enzymes; important ones are α-amylase, β-amylase, α-glucosidase, and limit dextrine. 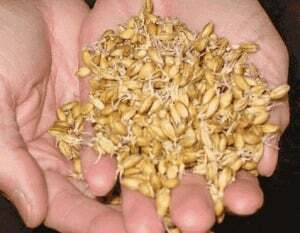 During malting, barley undergoes an incomplete natural germination process that involves a series of enzyme degradations of barley kernel endosperm. As result of this enzyme degradation, endosperm cell walls are degraded, and starch granules are released from the matrix of the endosperm in which they are embedded. Ultrasonics activates enzymes and improves the extraction rate of the intracellular material, e.g. starch, proteins. Arabinoxylan molecules tend to form macromolecular aggregates in the dilute polysaccharide solutions. Ultrasonication helps to reduce the aggregates of polysaccharides effectively. By the degradation of the polysaccharide starch, fermentable carbohydrates are produced. Such carbohydrates are converted into alcohol in the fermentation step of the beer manufacturing. All these ultrasonic effects on the bio-chemical processes during malting result in a shorter germination time and a higher germination rate / yield. Shortening the germination period results in significant commercial benefits for the malting and brewing industry. The ultrasonic treatments results in higher hydration and faster germination in shorter time. The highest seed germination (approximately 100%) was recorded at the 100% power setting. For the seeds sonicated for 5, 10, and 15 min at full power (100% power setting of the device), the germination rate was increased from ~93.3% (non-sonicated seeds) to 97.2%, 98% and 99.4%, respectively. These results may be attributed to mechanical effects due to ultrasonically induced cavitation increasing water uptake by the cell walls. The sonication enhances the mass transfer and facilitates the penetration of water through the cell wall into the cell interior. The collapse of cavitation bubbles near the cell walls disrupts the cell structure and enable for a good mass transfer due to the ultrasonic liquid jets. The method considerably reduced the time required to initiate the germination of seeds. Hair roots appeared faster in the treated samples and grew abundantly in comparison to the non-sonicated seeds. When using barley treated as above, the germination period was shortened to 4 to 5 days (depending upon the ultrasonic power and exposure time) from the usual 7 days. Furthermore, the mean germination time decreased from 6.66 days for the 20% power setting to 4.04 days for the ultrasonic power setting of 100% after a processing time of 15 min. 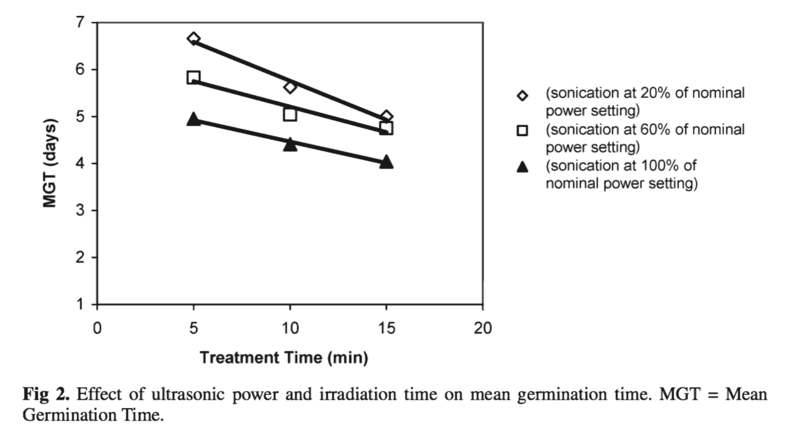 The analysis of the resulting data indicates that the extent of germination and the mean germination time were significantly affected by the different ultrasonic power settings during the germination test. All experiments resulted in increased germination of the barley seeds as compared to the non-sonicated control (Fig. 1). Maximum mean germination time was recorded for the 20% power setting and minimum mean germination time was recorded for the 100% power setting (Fig. 2). Sonication is also proven to enhance the seed germination of chickpeas, wheat, tomato, pepper, carrot, radish, corn, rice, watermelon, sunflower and many others. Hielscher Ultrasonics supplies reliable high power ultrasonicators for lab, bench-top and industrial use. For the seed priming and malting on a commercial scale, we recommend you our industrial ultrasonic systems such as the UIP2000hdT (2kW), UIP4000hdT (4kW), UIP10000 (10kW) or UIP16000 (16kW). 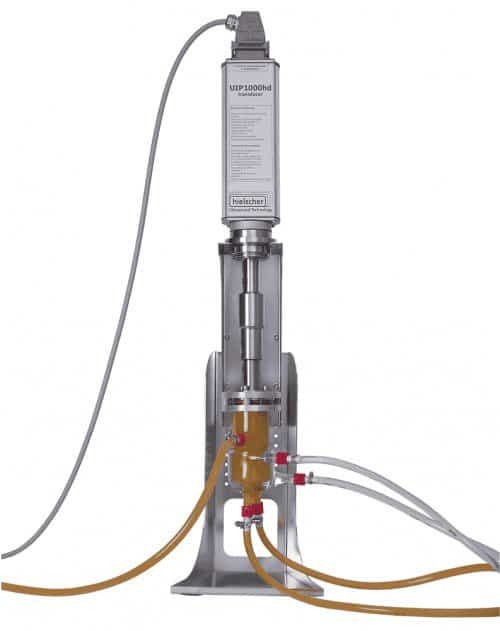 Manifold flow-cell reactors and accessories complete our product range. All Hielscher systems are extremely robust and built for 24/7 operation. To test and optimize the ultrasonic seed priming and germination, we offer you the possibility to visit our full equipped ultrasonic process lab and technical center! Contact us today! We are glad to discuss you process with you! Goussous, S. J.; Samarah, N. H.; Alqudah, A. M.; Othman, M. O. (2010): Enhancing seed germination of four crop species using an ultrasonic technique. Experimental Agriculture, 46/02, 2010. 231-242. Nilsson, Frida (2009): A Study of Barley Protein Composition during Beer Brewing Process using SE-HPLC. Degree project works at the University of Kalmar, School of Pure and Applied Natural Sciences, Sweden. Yaldagard, Maryam; Mortazavi, Seyed Ali; Tabatabaie, Farideh (2008): Application of Ultrasonic Waves as a Priming Technique for Accelerating and Enhancing the Germination of Barley Seed: Optimization of Method by the Taguchi Approach. J. Inst. Brew. 114(1), 2008. 14-21. Yaldagard, Maryam; Mortazavi, Seyed Ali; Tabatabaie, Farideh (2007): The Effectiveness of Ultrasound Treatment on the Germination Stimulation of Barley Seed and its Alpha-Amylase Activity. International Journal of Biological, Biomolecular, Agricultural, Food and Biotechnological Engineering 1/10, 2007. In malting the cereal grain germinates and it involves three steps: steeping, germination and kilning. During steeping, water is added to the grains which activate the enzymes. The conventional steeping takes 1-2 days. After 1-2 days the barley grains have reached a water content of 40-45%. At this point, the barley is removed from the steeping water and the germination begins. During the germination several enzymes are formed or activated, which later in the mashing process are essential. β-glucans are broken down by endo-β-1,4-glucanase and endo-β-1,3-glucanase. Endo-β-1,4-glucanase is already present in barley, but endo-β-1,3-glucanase is only present in malt. Because the β-glucans are gel forming and thereby can course problems in filtration, a high content of β-glucanase and a low content of β-glucan are desirable in malt. The starch content decreases and the sugar content increases during the germination and the starch is degraded by α-amylase and β-amylase. There is no α-amylase present in barley; it is produced during germination, while β-amylase is already present in barley. Proteins are also degraded during germination. Peptidases degrade 35 – 40 % of the proteins into soluble material. After 5 to 6 days the germination is completed and its life processes is inactivated by kilning. In kilning the water is removed by passing hot air through the malt. This stops the germination and modifications, and instead colour and flavour compounds are formed by Maillard reactions. The most important enzymes for the hydrolysis of starch in barley are the α-amylase and β-amylase enzymes that catalyse the hydrolysis of starch into sugars. The amylase degrades polysaccharides, namely starch, to maltose. β-amylase is present in an inactive form prior to germination, whereas α-amylase and proteases appear once germination has begun. Since α-amylase can act anywhere on the substrate, it tends to be faster-acting than β-amylase. β-amylase catalyzes the hydrolysis of the second α-1,4 glycosidic bond, cleaving off two glucose units / maltose at once. Other enzymes, such as proteases, break down the proteins in the grain into forms that can be used by yeast. Depending on when the malting process is stopped, one gets a preferred starch / enzyme ratio and partly converted starch into fermentable sugars. Malt also contains small amounts of other sugars, such as sucrose and fructose, which are not products of starch modification but were already in the grain. Further conversion to fermentable sugars is achieved during the mashing process. During the enzymatic hydrolysis, enzymes catalyze the saccharification process which means that the carbohydrates (starch) are broken into its component sugar molecules. By the hydrolysis, the energy resource (starch) is converted into sugars which are consumed by the germ for growing. Barley has a protein content of 8 to 15%. Barley proteins contribute essentially to the quality of the malt and beer. Soluble proteins are important for beer head retention and stability. Arabinoxylans and β-glucan are soluble dietary fibers. Malt extracts can contain high levels of arabinoxylans which can cause difficulties during the filtration since viscous extracts may significantly deteriorate the performance of the brewing processes. For the brewing process, a high content of β-glucan in barley may lead to insufficient degradation of cell walls, which in turn hinders the diffusion of enzymes, germination, and the mobilization of kernel reserves, and hence reduces malt extract. Residual β-glucan may also lead to highly viscous wort, giving rise to a filtration problem in the brewery, and it may participate in maturing of beer, causing chill haze. Arabinoxylans are found in the cell walls of barley, oat, wheat, rye, maize, rice, sorghum, and millet. The extractability of both arabinoxylans and β-glucan are significantly increased by sonication. Barley contains more than 50 proanthocyanidins including oligomeric and polymeric flavan-3-ol, catechin, and gallocatechin. Dimeric proanthocyanin B3 and procyanidin B3 are the most abundant ones in barley. Antioxidants are known for their ability to delay or prevent oxidation reactions and oxygen free radical reactions, which makes them important in the malting and brewing process. Antioxidants (e.g. sulfites, formaldehyde, ascorbate) are used as additives in the brewing process in order to improve beer flavor stability. About 80% of phenolic compounds in beer are derived from barley malt.